As a newlywed, I struggled to put delicious food on the table. I'd helped my mom in the kitchen growing up, but I hadn't been responsible for many meals on my own. And when Mr DIY and I married (back in 1992), we moved clear across the country....several thousand miles from my parents. There were nights I'd come home from work, take out a pound of raw ground beef, look at it and sigh....what to do? how to make it edible? Don't even get me started on raw chicken (gagging may have been involved). Now baking....that was a whole other story! Sugar and chocolate and vanilla and flour....I could take those on! 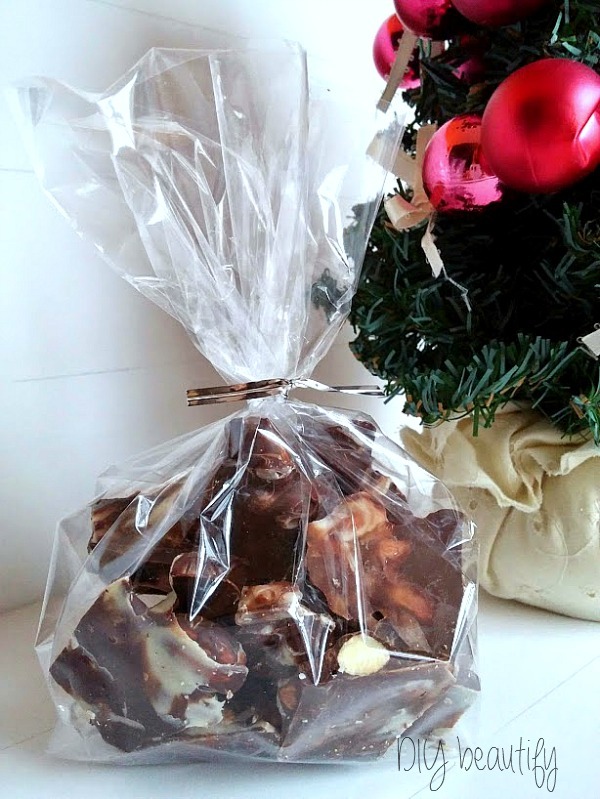 The biggest compliment I ever received was when I served this almond bark one Christmas...and my brother wanted to know where I'd bought it. He flatly refused to believe I'd made it...it's that good! 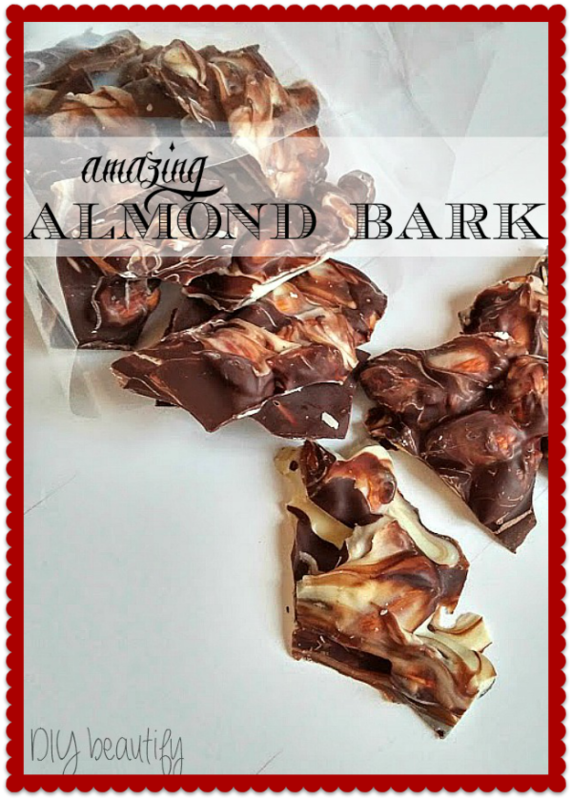 I've been making this homemade almond bark for 20 years and it's one of those recipes my family talks about all year long...they can't wait for me to make it! I have to give credit to the back of the Baker's Best chocolate box for the recipe all those years ago. I don't know if it's still on there, but I'll share the recipe with you with the minor modifications that I made to the original. This post contains affiliate links, which are always products I personally recommend! My full disclosure policy is available here. Also, feel free to double or even triple this recipe, especially if you intend to give as gifts. Start by toasting the almonds. I do this in a large skillet on my stove top (it takes about 15 minutes). I don't use any oil, just the nuts themselves. Use medium heat, mix regularly and watch them carefully. When they start to sizzle and some of the skins pop, they are usually ready. Meanwhile, melt the chocolates separately. You can do this in the microwave or in a double boiler on the stove top. Once chocolate is melted, add half of the toasted, whole almonds to each bowl and mix. Spread a piece of wax paper onto a cookie sheet. Add spoonfuls of the chocolate/almond mixture to the cookie sheet, alternating dark and white. Using a butter knife, spread the mixture to flatten and run the knife through the chocolate to create a marbled effect. Stick the cookie sheet into the fridge for about 30 minutes for chocolate to harden. Then, break into pieces and store in an airtight container. 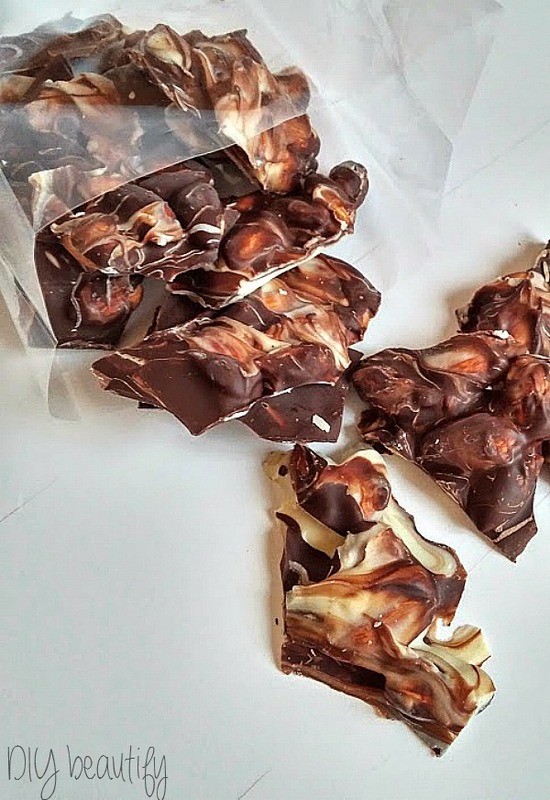 Or add pieces to clear treat bags for gift giving. That's it...3 ingredients to an amazing candy! The bittersweet chocolate gives it a deep, rich flavor that's not too sweet. This makes a wonderful gift to give to friends! And just so you know...I have learned how to cook, and raw meat no longer makes me gag! Here's wishing you a Merry Christmas! I'll be taking a short break from blogging until after the New Year to focus on family and getting some much-needed rest. Thank you Cindy looks delicious and easy, something I think I can manage. Have a wonderful Christmas with your family. This looks like such a yummy treat Cindy! I'll definitely give it a try. Thanks so much for sharing. Featuring you at our party this week. Happy New Year! This is yummy.I love the flavors and its simple.You way of presentation is also good.I will try this recipe.Thank you so much for sharing this wonderful recipe.